Islander. A self-confident youth always competing with Sora. He hated the monotony of island life and built a raft with Sora and Kairi to explore the outside world. Riku seems to have vanished along with the Destiny Islands. Islander. A self-confident youth always competing with Sora. When the Destiny Islands vanished, so did he. By the time Riku reappeared, Sora had already found new friends, so Riku didn't rejoin him. Riku is willing to go to any length to save Kairi--even join forces with Maleficent. Riku gained immense power through the forces of darkness. But ordinary humans are no match for the darkness, and it is gradually consuming his heart. When Kairi lost her heart, Riku allied himself with Maleficent to save her. Riku was actually the rightful master of the Keyblade, but once he chose darkness over light, the weapon chose Sora instead. Ansem exploited Riku's weakness of heart and possessed him. Baited by the darkness and used by Maleficent and Ansem, Riku once fought against Sora. In order to seal the door to darkness, Riku stayed with the king on the other side. His current whereabouts are unknown. Sora journeys in the hopes of finding Riku. A boy who was born and raised on a small group of islands. Riku dreamt of seeing other worlds, and so he forsook the islands—only to be seduced by the power of darkness. Enslaved by Ansem, pursuer of darkness, Riku clashed with his childhood friend Sora. But in the end, he was able to regain himself, and together with Sora closed the door to darkness. Still, the dark wounds in Riku's heart have yet to mend. What could his true purpose be? The form Sora's longtime friend Riku chose. Though Xehanort tried to control Riku from within, Riku's heart proved stronger. But the only way to wield the darkness fully was to become it. Riku began calling himself "Ansem," perhaps as a sign of resolve. He would live in darkness if that's what it took to wake Sora. Sora's longtime friend. He had clad himself in darkness in order to wield it, and had even changed in appearance. But when the real Ansem's Kingdom Hearts Encoder exploded, Riku returned to his old form. You could say it was a miracle—worked by a heart no darkness could eclipse. Childhood friends with Sora and Kairi. He donned the Organization's black coat pretending to be a member, and investigates their actions while waiting for Sora's memories to be restored. A little boy who yearns to see the outside world. Terra chose him to inherit the power of the Keyblade. Riku deeply cares for his friend Sora, and believes the strength he needs to protect people awaits him somewhere in the wider world. Sora's best friend. They grew up together on the Destiny Islands. But Riku was so desperate to leave their small, stifling home that he succumbed to the darkness. Eventually, he and Sora clashed. Fortunately, he met Mickey. With his new friend's help, Riku learned to turns his wrongs into rights, and eventually became one of Sora's greatest, unseen allies. A boy who wields a Keyblade. His battles to save the worlds have often pitted him against the darkness in his own heart. Now, he is braving the Mark of Mastery examination to find out if he is still worthy of the Keyblade. A childhood friend of Sora and Kairi. A childhood friend of Sora and Kairi who's fought Sora in the past. A childhood friend of Sora and Kairi. Reliable and inquisitive. A childhood friend of Sora who struggles with the darkness inside. A childhood friend of Sora and Kairi. He dreamed of going off to the outside world. A young Keyblade wielder who attempts the Mark of Mastery exam to test his potential. A true Keyblade Master and childhood friend of Sora and Kairi. Though he struggled with the darkness in the past, he learned to control his heart and successfully earned the Mark of Mastery. In order to gather the remaining guardians of light to confront Master Xehanort, Riku and King Mickey have gone searching for the lost Keyblade wielders who vanished over ten years ago. "If the world is made of light and darkness... We'll be the darkness." Riku is one of the main characters in the Kingdom Hearts series. He is a major playable character in Kingdom Hearts Chain of Memories and Kingdom Hearts 3D: Dream Drop Distance. He has lesser playable roles in Kingdom Hearts II and Kingdom Hearts III, only for minor battles. In Kingdom Hearts 358/2 Days, he is playable in Mission Mode. He lives on Destiny Islands with his best friends, Sora and Kairi, and all three of them dream of venturing from Destiny Islands to find out what worlds are out there. This dream comes true, although Riku becomes influenced by the darkness and struggles to find a place as Sora's ally. He eventually does and also becomes a Keyblade Master after passing his Mark of Mastery exam. Riku is chosen as Terra's successor. When Terra visits Destiny Islands, he can already sense Riku's potential, and asks why Riku wants to leave his island. Riku tells Terra that someone else left the island long ago, and visited other worlds. Riku states that he would like to leave his world too in order to become strong enough to protect his friends and everything else he holds dear. During their conversation, Terra sees a vision of a white-haired man who then transforms into Riku's sixteen-year-old self. This convinces him to choose Riku as his successor, and lets Riku hold his Keyblade to test his strength. He convinces Riku to keep their conversation a secret to preserve the world order. He and Sora later encounter Aqua, who finds their friendship similar to that of hers, Terra's and Ven's, and asks Sora to protect Riku if he ever loses his path. Sometime afterwards, Riku and Sora are resting on a beach under a starry sky at night. When they are ready to go home, Riku sees Sora's sudden tear of sadness and says that perhaps someone from another world is feeling sad somewhere and suggests that Sora try and reach out to him. After Sora reaches out to Ventus, they both look up at the starry sky. One night, there is a meteor shower and Kairi appears on the islands from Radiant Garden, another world far off from Destiny Islands. Riku, Sora, and Kairi quickly forge a powerful friendship. Soon after Kairi's arrival, Riku and Sora go to the secret place, a small cave that they frequently explored. While there, the two spot a mysterious door, though neither one can find a way to open it. The two decide to leave, but Riku manages to get a glimpse of Destiny Islands' Keyhole. "Once we step through, we might not be able to come back. We may never see our parents again. There's no turning back. But this may be our only chance. We can't let fear stop us! I'm not afraid of the darkness!" Riku, Sora, and Kairi often spend the evenings at a tree on an attached islet. Riku, Sora, and Kairi continued to live on the Destiny Islands together. The three work together to construct a raft and gather supplies so that they can set out and search for other outside worlds. While Riku and Sora continue their rivalry through duels and races, Riku takes jabs at Sora over his relationship with Kairi, telling him that if Sora does not share a paopu fruit with Kairi soon, he will. On the night before their journey, Riku opens the door in the secret place and the Heartless invade the islands. Kairi and Sora each set out for the island to make sure their raft is safe. Sora finds Riku, but finds that Riku is only eager to escape the islands. Darkness surrounds the two, and while Riku disappears into it, Sora gains the Keyblade. Riku eventually ends up in Hollow Bastion via the Corridor of Darkness, separated from his friends. There, he is found by Maleficent, and she offers him shelter and protection. In exchange for Riku's cooperation in gathering the Princesses of Heart, she agrees to find Kairi and bring her to him. During this time, Riku comes to possess a blade of darkness called Soul Eater. Riku comes across Sora in Traverse Town. He takes possession of Sora's Keyblade for a few moments before giving it back to Sora, much to Sora's surprise, and then he suddenly leaves. Watching Sora from a distance, Maleficent turns Riku against Sora, telling him that Sora has abandoned him and Kairi for traveling with Donald and Goofy. However, Riku is still highly suspicious of her motives. During Sora and Aladdin's fight with Jafar in Agrabah, Riku takes Jasmine to Hollow Bastion under Maleficent's orders. Maleficent reveals the whereabouts of Kairi's body. She claims that the only way to save Kairi, who appears to have lost her heart to the darkness, is to gain access to Kingdom Hearts. Riku teases Sora and runs off with Pinocchio. Riku meets Sora again in Monstro, intending to use Pinocchio to help him find a way to save Kairi's heart. However, Pinocchio is captured by the Parasite Cage, and Riku works together with Sora, Donald, and Goofy to save him. Afterwards, Riku kidnaps Pinocchio, and is pursued by Sora, Donald, and Goofy into Monstro's stomach. Riku asks Sora to join him and help him rescue Kairi, but Sora refuses, knowing that Riku's methods are wrong. When the Parasite Cage returns, Riku vanishes into a Corridor of Darkness. Riku retreats with Kairi and summons AntiSora to battle Sora. Maleficent bestows the power of darkness on Riku, giving him the power to command the Heartless. He then goes to Neverland, traveling on Captain Hook's ship, where Kairi's body is being kept. He appears before Sora, showing him Kairi's body. Sora warns Riku that the Heartless will eventually turn on him and devour his heart, but Riku refuses to listen and retreats after using his new powers to summon AntiSora. However, before he heads back to Hollow Bastion, he tells Captain Hook that the captured Wendy is not a Princess of Heart. Riku takes Kairi and recklessly returns to Maleficent's castle via the Corridors of Darkness without a vessel, putting a strain on his heart. While he is drained from the trip, Maleficent unlocks the last of Riku's dark power. At Hollow Bastion, Sora again meets Riku, stopping him from taking down the wounded Beast. Riku and Sora briefly talk then forcibly summons the Keyblade away from him, telling him that he was "just the delivery boy" and that Riku is the true Keyblade master. After leaving Sora with the toy sword he used on Destiny Islands, he departs, and Donald and Goofy reluctantly follow him as per The King's orders. Sora makes his way to the foyer of the castle, with the help of Beast. Riku, taking on a new appearance with the increasing strength of his dark powers, tells him to quit, but Sora refuses to leave without Kairi. Riku, intending to prove to Sora that he is the strongest of the two, attacks his old friend, but Donald and Goofy go to Sora's aid, finding themselves unable to betray Sora after all that they had been through together. With the strength of his friends, Sora reclaims the Keyblade, and drives Riku to fight him. Riku, defeated, manages to escape, but he is confused as to why Sora was able to regain the Keyblade. A cloaked figure appears to him from the Darkness, telling him that only one with a stronger heart can claim the Keyblade, and Riku's was weaker than Sora. However, the figure tells him that plunging himself into darkness will make his heart stronger. Riku does so, and he is possessed by the dark figure. The possessed Riku then comes before Maleficent, and warns her of the dangers of unlocking the Final Keyhole. When she claims not to be afraid, Riku shows a new, dark Keyblade created with six of the seven princesses' hearts. However, it doesn't react to the Keyhole. Realizing it is still needing Kairi's heart to be complete, Maleficent heads off to handle Sora and company. After Maleficent is defeated by Sora, Riku appears with his Keyblade and explains that unlike Sora's Keyblade, this Keyblade possesses the ability to unlock a person's heart, and Riku demonstrates this by piercing Maleficent's chest, allowing the immense darkness that is attracted to her to overtake her heart, transforming her into a giant dragon. When Maleficent is defeated again, he reappears, commenting on how Maleficent was being used by the Heartless from the start before disappearing again. Riku, declaring himself to be Ansem, the Seeker of Darkness, confronts Sora in the Grand Hall and reveals that Sora has Kairi's heart in his body. While Donald and Goofy look on, Riku and Sora clash again, with Ansem's presence amplifying Riku's dark powers. He fades away when he is defeated, but after Sora impales himself with the Keyblade to release Kairi's heart and disappears, Ansem reveals himself and attacks Kairi, Donald, and Goofy. Riku uses the last of his strength to hold back his possessor, and yells to the others to run. After they leave, Riku and Ansem are pulled into the darkness coming from the Final Keyhole. Riku tells Sora to take care of Kairi before the Door to Darkness is closed. A newly restored Sora, along with Donald and Goofy, eventually make their way to the End of the World. There, in the remnants of Destiny Islands, they once again confront Ansem, who has full control of Riku's body, and defeat him after a series of battles at the Door to Darkness. The pair make it to the Door to Darkness, but are unable to cross through the door themselves, as they are not from the Realm of Darkness. They aid Sora in closing it to prevent a horde of Heartless from crossing through, but not before Riku tells Sora to take care of Kairi. This leaves the pair trapped in the Realm of Darkness, looking for another way out. "Neither suits me. I'm taking the middle road." "Do you mean the twilight road to nightfall?" "No. It's the road to dawn." Riku awakens in the Realm of Darkness. An unseen presence gifts him a magic world card and asks him to choose between slipping back into slumber, or taking the card and making his way toward the truth. Riku decides that going back to sleep would be boring, and confidently takes the card. After Riku takes the card, he goes through a corridor of darkness constructed by Organization XIII to the lowest basement of Castle Oblivion, which has taken the form of Hollow Bastion by crafting itself from his memories. Secret Ansem's Report 11 Though Hollow Bastion is the same as he remembered it, he is unable to find anyone. While he searches, the voice speaks to and mocks the young teenager. At long last, Riku meets someone: Maleficent. Maleficent taunts him and his refusal of the darkness, but Riku fights and defeats her, hoping to prove that he is above the darkness. Mickey lends Riku his light. Riku leaves Hollow Bastion, only to see the true form of Castle Oblivion. The voice again comes to Riku, but this time reveals himself to be Ansem, who wants to take over Riku again. However, though Ansem is powerful, King Mickey comes to aid Riku with his light. Riku then manages to fend off Ansem for the time being. Before he departs, the Heartless leaves Riku with some world cards and the ability to wield his inner darkness as a weapon. Riku soon realizes that he has the power to detect the "smell" of darkness, and is discouraged by it, though King Mickey comforts him. However, King Mickey can only appear to Riku as a projection, for he is still in the Realm of Darkness. Still, with King Mickey's encouragement, Riku ascends the basements of Castle Oblivion in order to rid himself of his darkness. Meanwhile, as Riku travels through the lower levels of Castle Oblivion, Sora ascends the upper floors, being manipulated by Marluxia, a member of the mysterious Organization XIII and the lord of Castle Oblivion. But three other Organization members, Vexen, Lexaeus, and Zexion work to counter Marluxia by using the dark-wielding Riku against the light-wielding Sora. To further the trio's goals, Vexen independently appears before Riku and the latter wonders if Vexen is with "Ansem" (Xehanort's Heartless). Vexen cryptically responds that he is with "another Ansem". Still, Riku fights against Vexen, seeing him as an enemy. However, the battle only helps Vexen, who uses the data he gathered from the battle to create a replica of Riku. The replica soon comes to battle Riku, mocking Riku's fear of the darkness while the replica embraces it. However, the real Riku proves victorious, and the replica runs off. Soon, Ansem, Seeker of Darkness, appears again, saying that the replica is a model of what Riku should be, but Riku only reaffirms his desire to conquer his darkness. Ansem possesses Riku for an instance and eliminates Lexaeus. Passing through much of the castle (by this time, the bulk of Sora's adventure is complete, and Larxene and Vexen have been eliminated) Riku finds Lexaeus. Lexaeus, like the others, tells him that he should accept the darkness again, because if he doesn't, his journey will end here. The two fight, and Riku only manages to wear him down. As Riku moves in for the finishing blow, Lexaeus summons his herculean strength and knocks Riku unconscious with his Axe Sword. Lexaeus decides to eliminate him since taking him down was too much trouble, but as he does, he notices Riku becoming possessed by Ansem, Seeker of Darkness. This catches Lexaeus off-guard, and the possessed Riku takes the opportunity to put an end to him. Although Lexaeus is defeated, Riku ends up having a struggle with Ansem that he nearly loses. Just before the dark being can overwhelm Riku, Mickey saves him again and manages to bring him out of the darkness. Riku comes closer to the ground level, just as Marluxia's scheme fails and Sora finishes him off. Riku senses Marluxia's defeat, and Zexion quickly arrives on the scene to explain it. But he also reveals that Sora is the one who did the deed, much to Riku's surprise. Zexion quickly asks if Riku is capable of seeing Sora, for Riku shouldered the darkness for so long, and Ansem still resides in his heart. Riku tries to resist Zexion's comments, but Zexion ultimately gives him a world card of Destiny Islands. In Destiny Islands, Riku meets all of his friends, but they are all silent and they eventually disappear, even Kairi. Zexion throws all of Riku's fears at him at once, telling him he's responsible for causing them to disappear, and that he belongs to the darkness now. He finally transforms an illusion of him into a Darkside Heartless, telling him this is what he has become. Riku defeats the Heartless as Zexion disguises himself as Sora. He tells him that it's finally time to face the light. Riku sinks into the light as he begins to fade, but Naminé appears in the form of Kairi and tells him that he can't fade, because light can't destroy him, and neither can darkness, so he should accept both to drive away his fears. He awakens his dark powers again, admitting that it's a part of him and not evil, defeating Zexion. Zexion disappears, but is quickly eliminated by the Riku Replica with Axel. Riku nearly makes it to the main floor as Ansem, Seeker of Darkness, appears to control him, but King Mickey defends Riku again and finally appears for real. Riku is relieved at finally having a real friend with him. King Mickey explains that he found a card which showed him Riku's heart and he followed it back to him. Riku fighting Riku Replica in the memory-based Twilight Town. Riku uses the card, and ends up in Twilight Town. Ansem, Seeker of Darkness, appears again, but Riku tells him that he is not "Ansem", because his scent is not darkness—but rather something else. Riku also sees that this man is the voice that presented itself at the beginning of his journey. The voice finally appears and introduces himself as DiZ. Riku asks him what he really wants from him, and DiZ tells him he wants him to choose between light and darkness, because he lies in-between. The decision will be decided with Naminé, whom Riku looks for. However, the Riku Replica manages to find him, and demands another fight to prove him "worthy". The replica intends to destroy Riku in order to become real, but fails. However, Riku comforts him by saying that the replica's heart will go to the same place as the real one's, before the replica vanishes out of existence. Riku meets up with Naminé, who is with Sora in his memory pod, and explains the situation. She offers to seal away Ansem and Riku's darkness, so that he may forget them, but will have to sleep to do so. Riku refuses, hoping to win on his own, and leaves a satisfied Naminé. However, before he departs, he tells Naminé that he knows that it was she who appeared to him as Kairi, commenting that they smell the same. After meeting Naminé, DiZ appears again to Riku and the King (who notes that DiZ seems familiar). Knowing his choice, DiZ gives Riku a card that will draw out Ansem, Seeker of Darkness. After DiZ leaves, Riku tells Mickey to destroy him if he fails to stop Ansem, but he refuses, saying he'll only help him regain control, and Riku concedes. Riku faces Ansem alone for one final battle. Ansem asks why he still refuses him if he accepts darkness now, and inquires if Riku is still scared of the darkness. Riku denies this and merely says, "I just can't stand your foul stench." They fight and the last of Ansem is destroyed, but not before he says a part of him is still in Riku, and that he shall return. Riku walking the road to dawn. Riku and Mickey wait at the crossroads. Riku tells him that he can't go home yet, as Ansem's shadow still lingers in him, but Mickey says the darkness is a part of him. Riku, who now forms an equally strong bond to the King as Sora's friendship to Donald and Goofy, calls Mickey by his name at the King's request. They leave, taking Organization coats that DiZ gave them prior to confronting Ansem, and DiZ appears for one final question: if he shall take the "road to light" or the "road to darkness". Riku chooses neither; he instead chooses to take the middle road, "the road to dawn". Riku and Mickey eventually make it out of the plains and to Hollow Bastion. They separate after Riku realized he couldn't completely rid himself of the darkness festering in him. Deciding to return to DiZ and offer his help, Riku dons a blindfold, so that "his eyes couldn't lie" about the darkness that he is preparing to use. "You could say I am...the biggest nobody of them all." Riku defeats Xion, and begins to question her identity. Riku faces off with Xion on the bridge in Beast's Castle. Knocking her out, Riku removes Xion's hood, curious about what she looks like. Moving his blindfold off one eye to get a good look at her, he becomes shocked by her appearance. Riku interrogates her as to her identity and use of the Keyblade, while Xion demands to know why he's dressed as a member of the Organization. Telling her it's to make sure Sora sleeps in peace, Riku tells Xion that her Keyblade is a sham. Angered, Xion attempts to retaliate, but Riku gives her a chop to the back of neck, knocking her down. Riku advises her to leave the faithless Organization. When Xion calls him a fake, Riku accepts the comment, denigrating himself for his own mistakes in accepting the darkness. He leaves Xion to scream in anger. In the manga, Riku sees Xion as Kairi. Riku tells Xion she has to come up with a solution which works best for her and everybody else. Many weeks later, Xion leaves the Organization and visits Destiny Islands. Her confused memories give her an intense nightmare shared with Roxas involving Zexion and Riku's battle at Castle Oblivion's facsimile of Destiny Islands. Riku finds Xion and comforts her. He recalls a prior conversation with Naminé discussing what he needs to do to awaken Sora. After Xion wakes up on Destiny Islands, she inquires about Sora and the "girl he's always with", to which Riku explains that the girl is Kairi, a special friend of Sora's, and that the reason Sora is unable to wake up is that some of his memories are held within Xion. Despite needing Xion to reunite with Roxas and Sora, Riku gives her time to decide what she wants to do, with the advice that she should choose what is best for everyone. For a while, both Riku and Xion spend time together. After some time, Xion leaves with Riku to stay at DiZ's base in Castle Oblivion. Roxas and Axel continue to search for her across the worlds, and finally make contact in Twilight Town, but Xion quickly takes her leave while Riku stays behind to distract them. Later, Riku and DiZ check up on Sora's progress at Twilight Town. Naminé was not sure if she would meet Riku again, as they originally met when Sora was sleeping in Castle Oblivion. She discusses her difficulty trying to help recover Sora's memories, saying that both Roxas and Xion need to disappear in order to wake Sora up. Eventually, Sora's recovery comes to a complete standstill, and Riku volunteers for DiZ to take out Roxas. The next day, Riku reunites with Xion at Beast's Castle again. Riku tells Xion to visit Naminé at Twilight Town so that she can make an informed decision on what she should do with herself. Riku ask Mickey to protect and guide Sora, Donald, and Goofy upon their awakening. In The Woods, King Mickey runs across Riku-Ansem and prepares to attack, supposing him to be Xehanort's Heartless, but calms himself when Riku replaces his blindfold and returns to his normal form. Riku informs the King that he is leaving to fight a member of the Organization, and asks Mickey to protect Sora in the event that he does not return. Riku then encounters Roxas at Memory's Skyscraper as the latter begins a rampage to free Kingdom Hearts. Then, Roxas climbs the Memory's Skyscraper and throws Riku the Oblivion Keyblade, as they both take out the remaining Neoshadow Heartless. Riku and Roxas are both jolted by the fading memories it communicates of a now-erased Xion, and bemusedly finish off the remaining Neoshadows before turning on each other. Demanding to know why Riku stands in his way, Roxas explains that he is seeking to retrieve his lost friend by freeing Kingdom Hearts, but is angered when Riku responds that Xion's memories are already too far gone to save her. A furious Roxas is initially able to gain the upper hand, but is knocked down just when victory seems in sight. Riku gives in to his darkness in a last-ditch effort to take out Roxas. Riku returns the Oblivion to the unconscious Roxas and prepares to transport him, but is surprised when Roxas revives and once again attacks; in response, Riku jostles his sleeping memories by taunting Roxas as he once did Sora, inducing Roxas to respond as Sora would and confirming Riku's suspicions of Roxas: that he is Sora's Nobody. Even more enraged, Roxas slashes at Riku with the Oblivion and it passes on one final memory of Xion, which implore Riku to save Roxas by stopping him. Left with no other choice, Riku releases the darkness imprisoned in his heart and takes on Ansem's form permanently. Riku realizes that if he is to win in the Realm of Darkness, he must submerse himself in the same darkness. He quickly dispatches Roxas, then returns him to DiZ's base at the Old Mansion, where he introduces himself as "Ansem". "We must defeat Xemnas. He's the Organization's last survivor. C'mon." Riku introduces himself as Ansem. Riku continues to ally himself with DiZ, as they have a common goal: to help Sora awaken (though Riku finds his memories of Sora fading, being a side-effect of Naminé's toying with Sora's memories). Roxas's memory is erased by DiZ and he is placed into a Simulated Twilight Town, to live out his days until the time comes for him to meet Sora. Meanwhile, Riku watches over Roxas, periodically entering the town in order to keep Roxas ignorant to the truth, including keeping Naminé from saying anything important to Roxas. He also takes some keepsakes of Roxas's during some of his visits. With all these deeds done, Riku finally demands to know what DiZ's true objective is. Upon hearing that it is merely revenge (DiZ does not disclose against whom it is), Riku clenches his fist, shocked and disgusted at how DiZ is merely using him and Sora for his own selfish reasons. Eventually, when the time comes for Roxas, Riku makes sure to prevent the Nobodies from flooding the town. Soon, the goal Riku had been searching for is finally reached: Roxas joins with Sora. Though DiZ orders him to eliminate Naminé, Riku, feeling DiZ had no right in deciding her fate, decides to hand her to the now-renegade Axel of Organization XIII before leaving DiZ. Riku later comes into contact with King Mickey. Riku begs King Mickey not to reveal his whereabouts and condition to Sora, and the King reluctantly agrees. He then leaves the King the digital versions of Olette's Munny Pouch and Roxas's crystal orb that he had pilfered from Roxas earlier. Riku left these items behind to clue them in on the virtual Twilight Town's existence and to help them learn about Roxas. At Sunset Hill, as Axel and Naminé ponder about their fate as Nobodies, Riku allows them to leave, thanking them both for helping him and Sora throughout their first conflict with the Organization in Castle Oblivion a year earlier. Riku, along the other two, then escape Twilight Town via a Corridor of Darkness created by Axel. Riku then spends his time countering the Organization at every chance he gets, as well as keeping a watchful eye on Sora. Later, Axel tries to kidnap Kairi in an attempt to use her to turn Sora into a Heartless so Roxas would be reborn. However, Riku rescues Kairi by opening a Corridor of Darkness, and takes her to Twilight Town, where she meets Hayner, Pence, and Olette, but never reveals his identity. At the battle for Hollow Bastion, Sora, Donald, and Goofy end up in an empty realm, where Riku arrives. He says nothing to them, and only leaves the trio a box that contains sea-salt ice cream and a picture of Roxas, Hayner, Pence, and Olette in front of the haunted mansion before immediately departing. A hooded Riku confronts Sora in The Land of Dragons. Riku also arrives at The Land of Dragons, trying to warn the Emperor of a Heartless dragon that Xigbar had created. However, he ends up meeting Sora, and Sora attacks him, thinking Riku to be an Organization member. When Sora sees that Riku is wielding the Soul Eater, he begins to suspect Riku's identity. Advancing forward, Riku still goes ahead with his mission and warns the Emperor, but had to defeat Li Shang in order to do so. When Sora talks to the Emperor, the wise ruler's description of the man further cemented Sora's idea that the man he fought was Riku; though unaware of why he is wearing the coat, Sora is nonetheless relieved to know that Riku is safe. At some point following this encounter, Riku gained the ability to transform his Soul Eater into a true Keyblade. Its appearance reflected his nature of being between light and darkness, so he gave it an appropriate name: Way to the Dawn. Upon learning that the Organization had kidnapped Kairi to force Sora to slay Heartless for them, Riku heads to the Castle That Never Was and protects Naminé and Kairi from Saïx after Naminé has freed Kairi from her prison. To Kairi's surprise, Naminé calls Riku by name, and disappears. Though Riku attempts to depart when Saïx escapes, he is stopped by Kairi and Pluto. Kairi, excited to see Riku, removes his hood, but is met with the face of Ansem, Seeker of Darkness. Though Riku felt ashamed to be seen in the form of their old enemy, Kairi took it in stride, as she could see the real Riku beneath the façade. Kairi later is attacked by Heartless in her attempt to help Sora, and saved by Riku. He then gives Kairi the Destiny's Embrace Keyblade so that she may fight. After Sora defeats Xigbar, he and Kairi reunite. Riku tries to take his leave, but Kairi stops him. She then reveals Riku's identity, and with some concentration, Sora also sees Riku underneath his dark appearance. The revelation makes Sora overjoyed to the point of tears. Riku explains that he did not want to be found, thanks to his appearance, and confirms Sora's suspicions of the clues they found - namely, the ice cream and Roxas's photo. Afterwards, he and the others make their way up the castle, defeating the remaining Organization members save for Xemnas. During this time, Riku reveals the truth about Roxas to Sora, and realizes that he never had to fight him; Roxas had left Organization XIII because he had wanted to meet Sora in the first place, and would most likely have met him either way over time. Riku is restored to his original form. Near the top, Riku reunites with King Mickey and DiZ, who reveals himself to actually be Ansem the Wise. Ansem is using a machine to try and encode Kingdom Hearts into data, but Xemnas confronts him, and they trade bitter words. The machine then explodes, unable to handle Kingdom Hearts, sending Ansem the Wise to the Realm of Darkness while causing countless hearts Xemnas had collected into Kingdom Hearts to rain down on the world, creating a slew of Heartless. The explosion also cleanses Riku's heart and restores Riku to his original form, though he is still remorseful. After some encouragement, Riku traverses the rest of the castle alongside Sora, abandoning his cloak and blindfold. He and the others also encounter Maleficent and Pete, who decide to hold off the hordes of Heartless that are overtaking the castle, but only so that they will eventually take the castle for their own. Riku and Sora prepare to battle Xemnas. Riku and the others then confront Xemnas, refusing his demand to gather more hearts. Xemnas then removes Sora from the area, fighting him one on one, with everyone else calling out to him. When Sora returns, they see that Xemnas has already reached Kingdom Hearts, and disappears into it. A door, constructed by the will of the worlds, appears, and the three wielders of the Keyblade open it up and follow Xemnas. After a tough battle, Naminé appears again, opening up a corridor of darkness that leads to Destiny Islands, as Riku can no longer use them since Ansem's darkness is no longer in his heart. However, Xemnas attacks, riding on a gigantic robotic dragon, and separates Sora and Riku from the others. After a series of battles, the two of them are drawn into nothingness by Xemnas and face off in a final, exhausting battle. Towards the end of the battle, Sora is left open and Riku takes a blow intended to finish off his friend, giving Sora the opportunity to beat Xemnas into submission, after which Riku and Sora fire a beam of light from Sora's Keyblade which finishes off the Superior. After his defeat, Sora and Riku face an onslaught of Dusks ready to fulfill their master's final order to eliminate the Keyblade wielders, but Sora and Riku successfully destroy them and escape the realm, entering the Dark Meridian. Riku and King Mickey reunite at Destiny Islands. Riku, severely exhausted and injured, asks Sora to sit with him on the shore. Having the time to finally talk, the two reconcile with each other. Riku then comes across a letter in a bottle, written by Kairi, and gives it to Sora, believing him to be the proper recipient. Sora then manages to open the Door to Light, which they walk through. Riku and Sora found themselves falling through the sky and into an ocean. Bewildered, they hear Kairi's voice calling out to them and are greeted by their friends from Disney Castle. While Sora shares a hug by Goofy and Donald, Riku happily reunites with Mickey. Jiminy's Journal taking Riku's form. A data version of Riku is created by the digitization of Jiminy's Journal and becomes a vessel for the memories contained in the Journal. He appears as Riku does in Kingdom Hearts. One of the memories hidden in the Journal depicts Riku meeting Ansem on Destiny Islands. In the Destiny Islands room of the Dataspace's Castle Oblivion, Data-Riku reveals to Sora the memory of Riku on the Clock Tower. After reading Mickey's letter, Sora sits on the paopu tree while holding it and staring off into the sunset. Riku walks up to him and asks if he has decided, and Sora says that he has. He later smiles at Sora's decision to venture out to find those connected to him. Yen Sid prepares Sora and Riku for their Mark of Mastery exam. Riku accompanies Sora to the Mysterious Tower in response to a call from Yen Sid to undertake the Mark of Mastery exam in order to prepare for the coming return of Master Xehanort. Once told of the threat Master Xehanort poses, Riku does not hesitate to take the exam, seeing it as an opportunity to see whether or not he is worthy of wielding the Keyblade, especially after his past with the darkness. For their exam, Riku and Sora are sent to the Sleeping Worlds, where they are to awaken several worlds that were restored following the defeat of Ansem but remained in a state of deep sleep. Riku and Sora's journey starts on Destiny Islands, but they soon move on, and end up in Traverse Town, where Riku ends up separated from Sora, but discovers his new attire and abilities. After meeting up with Joshua, Shiki and Beat who tutor him, Riku sets off on his journey alone, venturing across several worlds, meeting new friends and battling new villains. But along the way, Riku comes into conflict several times with a mysterious young man with ties to Master Xehanort, accompanied by Ansem himself, who remind Riku of his past experiences with the darkness and try to get him to succumb again, but Riku refuses, reminding Ansem that he walks the road to dawn. He also encounters Dark Riku, who he believes to be his dark side during his travels. Riku faces off against Young Xehanort at the Sanctum of Time. However, once all the seven Keyholes in the Dreaming Realm are sealed, Sora ends up trapped in sleep in The World that Never Was, and Riku rushes to his rescue upon realizing this. He finds Sora in a comatose state inside the Castle, his heart having been damaged by Xemnas and the young man himself. The young man turns out to be an alternate timeline incarnation of Master Xehanort in his youth, who has been traveling to different periods in time to recruit several other incarnations of Xehanort together. Riku attempts to awaken Sora, but the darkness from Sora's nightmare turns into the Anti Black Coat that engages Riku. Riku manages to defeat the Anti Black Coat and carries on through the castle, eventually coming face to face with Ansem. Ansem reveals that Riku is actually a Dream Eater, and, over the course of the exam, has been purifying Sora's dreams of Nightmares. Ansem attempts to take over Riku's body again, but remembering his secret encounter with Terra, Riku resolves to make his inner darkness his own power for good and make Ansem become part of his light. Then the two battle each other once more. Ultimately, Riku prevails and eventually makes his way to Where Nothing Gathers, where he finds Sora on an Organization XIII throne. Young Xehanort blocks Riku's way, but Mickey comes to Riku's aid by casting a Stopza spell. Young Xehanort, however, is unaffected by the spell and knocks Mickey aside to battle Riku. After a fierce struggle, Riku defeats Young Xehanort. However, the victory is short-lived, as Master Xehanort is finally revived and joined by the rest of his new Organization, among them are Young Xehanort, Ansem, and Xemnas. Master Xehanort fills Riku and Mickey in on his past attempt to create the χ-blade by pitting Ventus and Vanitas against each other. The plan failed, but he had a backup: Master Xehanort had Young Xehanort create a new Organization XIII made of Master Xehanort himself and twelve vessels to harbor a piece of his heart in order to create thirteen darknesses to battle seven lights and recreate the χ-blade. The thirteenth vessel was intended to be Riku but he became unfit as he built a resistance to darkness. The Organization then sought to use Roxas but he became too self-aware and returned to Sora, so now Sora has been chosen to be the last vessel. Riku and Mickey attempt to save Sora from Master Xehanort but are restrained by Ansem and Xemnas before Lea arrives and saves Sora. Ansem summons his Guardian, who grabs Riku and Mickey, but the Guardian is defeated by Donald and Goofy, who arrive via Mickey's old Star Shard. His plans temporarily derailed, Master Xehanort retreats with his Organization. Riku uses the Kingdom Key to awaken Sora's heart. Riku brings Sora's comatose body back to the Mysterious Tower and dives into Sora's body to mend his fractured heart. In the process, he is forced to battle Sora, clad in Ventus's Keyblade Armor, which has been corrupted by a Nightmare. Riku defeats the Nightmare and uses Sora's Keyblade to enter a memory of the Destiny Islands, deep inside Sora's heart. Here he meets projections of Roxas, Ventus, and Xion, who each ask a question before disappearing. After answering the three questions, Riku finds a bottle in the surf, and a data projection of Ansem the Wise approaches him. Ansem tells Riku about Ansem's Code, research data contained in the bottle that he had hid inside Sora while he was asleep. He muses about Sora's ability to connect with others' hearts, and how it may be able to bring back those that have been lost. He tells Riku that by defeating the Nightmare and answering the three questions, he has successfully awakened Sora. Riku returns to the real world, reuniting with Sora and the others, and Yen Sid names Riku as a Keyblade Master. Riku and the other are shocked when Lea vows to catch up with him, reveals his plan of becoming a Keyblade Master, and successfully — albeit accidentally — summons his Keyblade. As his first duty as a Keyblade Master, Yen Sid orders Riku to bring Kairi to him to undergo training with her Keyblade in order to counter Master Xehanort's new Organization. Riku and Mickey head off with their new duds. After bringing Kairi to be trained as a Keyblade wielder, Riku listens to Yen Sid's plans to protect the other Princesses of Heart and to bring back Terra, Aqua and Ventus. Mickey reveals to Riku that Aqua was with him back when they sealed the Door to Darkness, but she stayed behind to stop a swarm of Heartless which were chasing Riku. Outraged by the story, Riku demands to know why Mickey kept this secret, but Yen Sid explains that because no one was capable of entering the Realm of Darkness and saving Aqua at the time, he forbade Mickey from ever telling anyone about Aqua as precaution against reckless rescue attempts; while Riku would have understood the danger of such an action, Sora would have cast caution to the wind and jumped at the chance to help. However, now they are both strong enough to mount a successful attempt, and when Kairi teases Riku for his eagerness, he explains how he is learning to follow his heart like Sora. When Kairi shows anxiety at training with Lea, Axel's human form, Mickey and Riku reassure her that he is trustworthy and he even saved Sora. Yen Sid provides Mickey and Riku new clothes from Flora, Fauna, and Merryweather which will shield them from the dark realm's darkness, so Riku and Mickey head off to save Aqua, with their new gear in tow. Riku leaves his shattered Keyblade for the Replica. In order to gather the seven guardians of light, Riku and King Mickey enter the Dark World in search of Aqua. They follow her trail to the Dark Margin, but when they arrive, they find no trace of her, her trail having gone cold deeper into darkness. A group of Shadows appear and form a Demon Tower, which quickly overwhelms them. Riku finds himself consumed by the darkness, nearly drowning in it, until he is saved by his replica's disembodied heart. He blacks out and wakes on the beach, finding his Keyblade destroyed from the battle. Though Riku insists on staying to save Aqua from the same fear and loneliness he once felt in the Dark World, Mickey convinces him to retreat back to Yen Sid to regroup and resupply. Before leaving, Riku plants his broken Keyblade on the beach for the Riku Replica to collect. At the Mysterious Tower, Yen Sid suggests that as Aqua visited many worlds during her own journey, it may be prudent for Riku and Mickey to follow her footsteps to gain clues to her current whereabouts. He provides new garments for Kairi and Lea, and requests that Riku and Mickey deliver them when they visit Merlin to gain new Keyblades. Now armed with the Braveheart, Riku travels with Mickey to Radiant Garden, the last place Aqua was seen in the Realm of Light. They discuss the path of Xehanort's heart through time and vessels, and the realization that the Xehanort that served Ansem the Wise was in fact a possessed Terra. After a phone call from Sora, they head into the castle to discuss the replica project with Ienzo. Without any new leads to her location, Riku and Mickey travel back to the Dark Margin to pick up Aqua's trail. Again they are assaulted by the Demon Tower, and again are overwhelmed by it. This time, however, Mickey is disarmed and trapped within it, and Anti-Aqua reveals herself from its depths. She claims Mickey's Keyblade, planning to use it to return to the Realm of Light, leaving Riku and Mickey trapped behind as she was. Riku connects with his replica's heart and uses their combined strength to confront Aqua and the Demon Tower. The fight takes its toll on Riku and, faltering, he speaks Sora's name. This connection allows Sora to enter the realm of darkness, where he defends Riku and defeats Aqua, freeing her from the Darkness. Riku is by her side as she awakens in the Realm of Light. With all seven guardians finally assembled, they meet at the Mysterious Tower, where Riku thanks Aqua for saving him during his first visit to the Realm of Darkness. Yen Sid tells them all to spend the day recuperating before meeting at the Keyblade Graveyard. Riku accompanies Sora and Kairi to the Destiny Islands, but spends the evening on the beach alone so he may speak to the replica in his heart. The replica admits he would rather exist within Riku's heart than fade into darkness, and states he has "one last thing to do". The seven guardians of light are surrounded by Heartless. The next day, Riku joins the other guardians in the Keyblade Graveyard, where he helps battle the horde of Heartless, Nobodies, and Unversed summoned by the real Organization XIII and passes through the fissure ahead of Sora. On the other side, Terra-Xehanort appears and attacks the guardians, incapacitating Ventus and Lea before being ejected from the battlefield. In his wake, a massive Demon Tide appears, and though Riku tries to rally Sora and Aqua to fight it, it quickly devours them all except for himself and Sora. As Sora breaks down in tears, Riku steps forward with a simple statement of faith in him, and faces down the Demon Tide alone. Unable to stem the tide, Riku and Sora are both swallowed by darkness. However, Sora is able to recover himself in the Final World and track down his friends hearts using the power of waking. Riku's heart makes its way to Olympus, where it is captured by a Lich. Sora manages to catch the Lich and free Riku's heart, sending it back to the Keyblade Graveyard. When Sora frees all of his friends' hearts, they reappear together, moments before Terra-Xehanort first appeared. Riku fights Dark Riku alone. This time, they are rescued from Terra-Xehanort's attack by the Lingering Will, allowing Riku and the others to fight off the incoming Heartless while Sora, Donald, and Goofy defeat the Demon Tide. Finally, they advance to face the organization within the Skein of Severance. Riku battles Dark Riku, Xigbar, and Ansem alone until Sora arrives. Ansem flees the battle, but Sora and Riku manage to defeat the others. The Riku Replica's heart exits Riku's body, and reveals that Dark Riku is, in fact, his own heart from the past. He pulls Dark Riku's heart from the replica body and leaves the vessel behind for Naminé. Riku then proceeds through the maze alone. He meets Sora and Mickey again after nine seekers of darkness have been defeated. Ansem, Xemnas, Master Xehanort, and his younger self remain, and Master Xehanort reveals that their four clashes would forge the final keys he needed to form the χ-blade. Riku claims that even if Master Xehanort manages to open Kingdom Hearts, they would simply defeat him and close it again. The two groups clash, and all but Master Xehanort are eliminated. As Ansem fades away, he speaks to Riku, reminiscing on the journey they shared. With one key left to forge, Xehanort reveals the kidnapped Kairi and slays her in front of them. Sora and Riku both attempt to attack Xehanort, but are easily repelled. Riku and Mickey are then frozen by a Stopza spell, and Xehanort summons Kingdom Hearts. The other guardians arrive as the spell wears off, and Riku presents the idea of using Xehanort as a portal and trapping him in it long enough to finish him. Though Riku, Mickey, and Aqua plan to go into the final battle, Sora, Donald, and Goofy volunteer to go instead, so that the other Keyblade wielders could remain to hold back the power of Kingdom Hearts. Naminé reunites with Riku in her new individual body. Once Xehanort is defeated, Riku and the others follow their hearts to Sora. They lend their power to Sora as he uses the χ-blade to seal Kingdom Hearts away. Returning to the Keyblade Graveyard, Sora decides to use the power of waking to rescue Kairi. Though Mickey tries to argue, Riku convinces him to let Sora follow his heart. Some time later, Riku takes Sora's gummi ship to Radiant Garden to collect Naminé, and returns with her to Destiny Islands along with all the guardians and their friends. He runs a race with Terra and Roxas before looking toward the paopu tree where Kairi sits with the fading image of Sora. Riku is five years old during Kingdom Hearts Birth by Sleep, fifteen during the events of Kingdom Hearts and Kingdom Hearts Chain of Memories, sixteen during the events of Kingdom Hearts 358/2 Days and Kingdom Hearts II, and seventeen during the events of Kingdom Hearts 3D: Dream Drop Distance. Riku is a teenage boy with silver hair with bangs, pale skin, bright blue-green eyes, and a muscular build. Since he is a year older than Sora and Kairi, Riku is the tallest of the trio. Riku's hair was originally shoulder-length, but in Kingdom Hearts 358/2 Days and Kingdom Hearts II, his hair has grown longer until it reaches his upper back. Some time before Kingdom Hearts 3D: Dream Drop Distance, he cut it short to the length it was when he was a child. Much like Sora, while his general appearance does not change much throughout the series, Riku receives several costumes and form changes during the course of his adventures. Riku's name is derived from the Japanese word for "Land" (陸, Riku?). "I've always wondered why we're here on this island. If there are other worlds out there, why did we end up on this one? And... suppose there are other worlds... then that means ours is just a little piece of something much greater." In Kingdom Hearts, Riku is a calm, cool, collected teenager who is not afraid to go beyond his limits. He showed no fear in stepping into the dark portal when Destiny Islands was being consumed by darkness. He seemed to be aware of Sora's romantic feelings toward Kairi, and enjoyed teasing him about it, such as challenging Sora to a race, and saying that if he wins, he gets to share a paopu fruit with her, purely to get a reaction out of Sora. This also exemplifies his competitive nature. Riku (partly thanks to Maleficent) became thoroughly jealous of Sora after learning about his possession of the Keyblade and of his new friends. He even openly accused Sora of forgetting about him and Kairi since he was not also actively looking for a way to retrieve Kairi's heart. That envy eventually corrupted his perspective of their friendship into a rivalry, much to Sora's confusion, and resulted in his battles with Sora and his eventual possession by Ansem, Seeker of Darkness. While his traits weren't very heroic for most of the first game, Riku becomes much more noble by the end. Since Riku had done everything he had out of care for Kairi, when Ansem was about to use him to use her along with the other six Princesses of Heart to open the Final Keyhole, he finally broke free and held off Ansem long enough for Donald, Goofy and Kairi to escape. When Riku finds himself in the endless abyss near the Door to Darkness, he is on his knees, overwhelmed with guilt for what he has done. In Kingdom Hearts Chain of Memories, Riku makes many self-realizations, one of which is that he had let his heart become weak, and some time after that, he would shy away from the darkness within it. Through his battles in Castle Oblivion, he makes another big realization: he can't get rid of the darkness in his heart, and decides to use it without turning away from the light like before, declaring his path down the "road to dawn," also signifying his effort for redemption. Additionally, he forms a strong bond with Mickey during their time together in Castle Oblivion, and later begins to address him familiarly throughout the rest of the series. In Kingdom Hearts II, he shows a great amount of loyalty and protectiveness for his friends. He never wanted Sora and Kairi to find out about his time spent in the darkness, and did everything he could to bring Roxas to DiZ to make Sora whole again, even going as far as giving up his physical form and assuming Ansem's. As Sora journeyed through the worlds, Riku left him valuable clues, such as the sea-salt ice cream and the picture of the Twilight Town gang, and almost died to protect him from Xemnas' attacks, which left him greatly injured after the battle. When he is finally found in the World That Never Was, he repeatedly shows signs immense regret for his previous behavior. He could not understand how Sora is so willing to forgive him, telling him that he didn't actually want to be found, and almost refusing to come back to Destiny Islands because of his shame for his wrongdoings. Though Riku humbles significantly over the course of the series, he still retains a lighthearted and jokingly arrogant side, referring to Sora, Donald and Goofy as "wise guys" to the Emperor, cracking a joke about Donald and Goofy's intelligence, and calling Sora a "total sap" before joining forces to confront Xemnas. When he was young, Riku had been curious with everything that is outside of his world. Over time, his curiosity became obsession, and he eventually opened his heart up to darkness in order to escape his "prison surrounded by water," as phrased by Ansem. This obsession completely vanishes throughout the year of Sora's slumber, most likely because of all the trouble it brought into his formerly simple life and how foolish he ended up acting once his curiosity was sated. When he returns to Destiny Islands in Kingdom Hearts II, he still comments on how small a world it is, but agrees with Sora's remark that it is part of one much bigger. This shows that Riku has a much better view of his homeworld than before, making him all the more content. Like Sora and Roxas, Riku can wield the Keyblade, though he can wield both his own and others since Terra chose Riku to inherit the Keyblade in Kingdom Hearts Birth by Sleep. In comparison to Sora's two-handed style and Roxas's dual-weaponry, Riku attacks with a fast one-handed style with his Soul Eater/Way to the Dawn, where he has a rather unique and signature fighting stance, where Riku holds his weapon above himself at his following side/arm (being his right arm) and puts his leading left hand out with its open palm being shown. Riku attacks very quickly with either weapon in combat in one-handed strikes ranging from thrusts to wide strikes focusing on more on slashing motions as opposed to Sora's clubbing/pummeling style, and is just as adept with his weapons as Sora is with his. His strength and agility are best demonstrated on Destiny Island, where he is known as the strongest child on the island (Tidus remarked that he, Wakka, and Selphie were defeated by him even after they triple-teamed him), and possesses an athletic springing kick if knocked down. Though Sora has bested Riku on several occasions, it is still unclear who is truly stronger. Riku is also shown to be skilled in hand-to-hand combat, as shown in Kingdom Hearts 358/2 Days, in which he easily knocks down a charging Xion with a single punch after dismissing his Soul Eater weapon. Riku showed another glimpse of his strength in Kingdom Hearts 358/2 Days by defeating Xion with ease and holding his own against Roxas. Riku's strength is acknowledged in Kingdom Hearts II when Sora and Donald express their disbelief that Riku could be defeated by anyone. At first, Riku had no powers whatsoever, although he was a rather strong individual. After arriving in Hollow Bastion he gets his weapon, Soul Eater. It gave him a slight increase in power, but as seen in the battle versus the Parasite Cage, he was only slightly more powerful than on the islands. Sometime after Monstro, Riku made a pact with Maleficent. This gave him three new abilities: The ability to summon and control Heartless, the power to traverse the worlds using Corridors of Darkness, and finally the ability to craft Anti forms. He demonstrated the first two abilities several times, and the third he used on Sora to create many AntiSoras and one complex one wielding a shadowy Keyblade. After Sora left Neverland, Riku returned to Maleficent who gave him a large increase in his dark abilities. This allowed him to draw on dark energies to increase his physical power and clothe himself in an organic-looking suit of darkness. While in this Dark Mode he could zip around the battle field at an incredible speed and each blow from his Soul Eater dealt large damage. However, this form was taxing on his heart as seen after his battle with Sora in Hollow Bastion. It is revealed that Riku was to be the original recipient of the Keyblade, but when he opened the Door to Darkness in Destiny Islands, plunging that world into Darkness, it instead chose Sora. However, in Hollow Bastion, Riku took the Keyblade from Sora by using the sheer strength of his heart, though when he uses the darkness within himself, his power over the Keyblade weakens and it returns to Sora who had proven the strength of his own heart. When Ansem, Seeker of Darkness, possessed his body he gained incredible new powers, but he was now stuck permanently in dark form because of the darkness pouring out of him. In addition, he took six of the seven Princesses' hearts and used them to form the Keyblade of heart. Riku's enhanced dark powers under possession are Dark Raid, where he throws a spinning Dark Keyblade, Dark Break where he performs a powerful jump attack, Dark Firaga where he counters a spell by shooting an orb of dark energy, and Dark Aura where he dashes around the arena at high speed slashing all in his path. When he is playable in Kingdom Hearts Chain of Memories, he is given a preset deck in each world that cannot be changed and changes automatically during gameplay. By breaking his opponent's cards, Riku acquires "DP", which let him transform into Dark Mode. Dark Mode, along with giving him increased speed and increased strength, gives him access to sleights that mimic his special attacks from Kingdom Hearts. Outside of Dark Mode, any combination of stocked cards counts as a sleight and costs Riku a card, so he cannot perform combo attacks as easily as Sora can. Instead, he has access to a unique system of battle called "card dueling", which allows Riku to stun opponents and perform special commands by breaking their cards multiple times. Overall, in contrast to Sora who must rely on sleights and combos to fight, Riku's playing style is more up-front, relying on card duels and breaks to acquire DP and enter Dark Mode. In this game, Zexion said his scent is very similar to Xemnas's. In gameplay, it is also shown that Riku can run faster and jump higher than Sora. At the end of Kingdom Hearts 358/2 Days, he used the power of darkness to help him defeat Roxas. This surge of power distorted his physical form, causing him to appear identical in appearance to Ansem, Seeker of Darkness. While trapped in this form he could use Xehanort's Guardian and use some of Ansem's attacks for a limited time in addition to his other powers. Riku's power increased in this form shown when he easily defeated Roxas as well as easily overpowering Saïx, forcing the latter to flee. Riku's Soul Eater changes into Way to the Dawn sometime between the second visit to Land of Dragons and The World That Never Was. When he turned into his "true form" in the end of Kingdom Hearts II, his powers of light increased dramatically while his powers of darkness decreased. As a party member, Riku possesses various abilities that combine his dark powers with Sora's light powers. Riku can use a new Dark Aura that fires Dark Firaga orbs that inflict a Stop effect whenever Sora completes a combo, Dark Shield to project a barrier of darkness, as well as to numerous other powers. In his Limit with Sora, Eternal Session, Riku is able to project waves of dark energy from his Keyblade in addition to unleashing fast combos and Dark Firaga barrages. At the end, Sora and Riku toss their Keyblades together to act as a super-damaging magnet. It should be noted, though, that despite the fact that Riku is a wielder of the Keyblade, he can't use any of Sora's keychains while he is in the party. Also, Riku is one of the three only characters shown being able to summon more than one Keyblade at once, the other two being Roxas and Sora. In Kingdom Hearts III, Way to the Dawn is snapped in half by a Demon Tower in the Realm of Darkness. Riku leaves it behind for the other him, and goes to ask Yen Sid to help him get a new Keyblade to replace it. This Keyblade, Braveheart, resembles a modern car key. In Kingdom Hearts, Maleficent gives Riku the power to control the Heartless for a short time. Later, Maleficent unlocks his dark powers which he has used throughout the series. Ansem, Seeker of Darkness possessed Riku and gave him all of his power. In Kingdom Hearts Chain of Memories, Riku was able to escape the Realm of Darkness through the subconscious use of his dark powers. Riku also gained full control over his dark powers and finally defeated Ansem. As a playable character, Riku has limited options in term of abilities as his default form only allows the use of his Soul Eater card. This form of attack is slow and sluggish however it deals a heavy amount of damage, especially when combos are used. Riku can stock attack cards together but this creates a slightly quicker combo instead of a sleight. With the help of Mickey's friend card, Riku has healing capabilities that can be empowered by stocking multiple Mickey cards together to form the MM Miracle sleights. Combining a Mickey card with Riku's Soul Eaters creates an offensive sleight, Holy Burst, that joins Riku's and Mickey's power together. Other perks Riku has access to include Potions, Hi-Potions, and enemy cards. In terms of athletic ability, Riku is sluggish as he performs a tumble in place of a Dodge Roll. After accumulating enough DP on the Dark Gauge, Riku enters Dark Mode, where he is faster, stronger and capable of using an array of special abilities. His regular combo is heavily upgraded as the finishing attack has the opportunity to stun enemies. A quick, clean dash takes the place of his tumble. Additionally, the Holy Burst sleight is replaced with a more powerful Inverse Burst that has a longer duration. Most importantly, Riku has the ability to use three new sleights in Dark Mode by stocking together three attack cards. The sleight chosen depends on the sum of the card values. The lowest value sleight, Dark Break, causes Riku to leap into the air and attack enemies from above. Dark Firaga shoots a bolt of dark energy at an enemy. Lastly, Dark Aura, a sleight requiring the max value of 27, allows Riku to rush enemies repeatedly from all directions and then release a mass of dark energy at the end. In Kingdom Hearts Re:Chain of Memories, Riku has the ability to use Dual sleights, which are triggered after winning a card duel. Depending on the enemy, Riku will use one of three sleights: Impulse, Maelstrom, or Barrage. The former deals damage to multiple enemies while the other two are concentrated on one enemy. When Riku is in Dark Mode, he uses more powerful, upgraded versions of the default Dual sleights: Dark Impulse, Dark Maelstrom, and Dark Barrage. Riku is unlocked as a playable character in Mission Mode, after being promoted to "Agent" rank on Day 172. He wields his Soul Eater and Way to the Dawn Keyblades, which are labelled in-game as a "Sword" weapon category. Riku's combo attacks contain quick and powerful strikes and his combo finishers usually hit more than one enemy, making him decent in crowd control. Riku's stats rate him above average, with decent strength and HP. Riku excels in the Critical area, with high Critical chance and bonus. However, his magic leaves something to be desired. 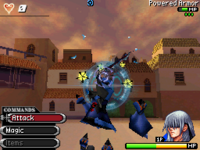 Riku's Limit Break, Darkstrom, causes him to dart around the field and attack enemies. In the Final Limit, Riku's weapon is enveloped in light, which he uses to swing at enemies, similar to Roxas's and Xion's Event Horizon Limit Break, although Riku's swings are noticeably slower. As a party member, Riku is very similar to Beast from Kingdom Hearts, in the sense that he is the game's final party member, as well as the strongest. He has high strength, magic, and above-average defense. He has two armor slots, one accessory slot, and six item slots. He has great flexibility in that he can deal high amounts of damage and he has the capacity to heal and block attacks. Riku's main action abilities are executed as reaction commands that become available after certain situations. After Sora finishes a combo, Riku can use Dark Aura to fire multiple dark orbs that stun enemies. When Sora takes damage, Riku can cast Dark Shield to protect him. Riku can also use one non-reaction command ability, Cure Potion, which restores the party to maximum health. His limit, Eternal Session, unleashes a joint attack between Sora and Riku that expels high amounts of damage. He has access to some of the most useful support abilities, such as MP Hastega, Second Chance, and Once More, in addition to ones with more miscellaneous effects, such as Item Boost, Defender, Auto Limit, and Hyper Healing. Riku is also temporarily playable during the final battle against Xemnas. During this time, he has only three commands: Dark Aura, Attack, and Jump. When Riku and Sora enter Sleeping Worlds, Riku unknowingly enters Sora's dreams. In doing so, he takes on the role of a Spirit Dream Eater. He has the ability to fuse with Spirits in his party, letting him use Link Styles. Unlike Sora, Riku uses many Dark-type techniques, like Dark Break, Dark Aura, and Dark Splicer. He also shares many exclusive combat commands with Terra from Kingdom Hearts Birth by Sleep, such as Zantetsuken, Sacrifice, Meteor, Limit Storm, and Meteor Crash. He uses similar action commands to Aqua, such as Dark Barrier and Doubleflight. By the time his Mark of Mastery exam was near its end, Xehanort's younger-self had revealed that Riku's long-time exposure to darkness made him immune to its corrupting qualities, which prevented him from becoming one of Master Xehanort's new vessels, along with the power he gained from accepting himself. Roxas's battle with Riku, as seen in Another Side, Another Story, involves him running up the side of Memory Skyscraper and passing by Riku as he leaps off. A similar scene occurs when Sora and Xemnas later battle in the same area. Riku is the first non-party assistance character to appear in the Kingdom Hearts universe as he helps Sora, Donald, and Goofy fight the Parasite Cage in Monstro the first battle. It is stated in The Director's Secret Report XIII that one of the four untold stories is "the period of Riku's absence" though that has not been further delved into. The other three were about "the period of the King's absence" (Kingdom Hearts 0.2 Birth by Sleep -A fragmentary passage-), Roxas's time with the Organization (Kingdom Hearts 358/2 Days), and Xehanort's past (Kingdom Hearts Birth by Sleep). An interesting note is that Riku wields Soul Eater, the Kingdom Key, and the Keyblade of heart on the opposite side of the handle, with the blade facing down when he is in his battle stance, except as a playable character in Kingdom Hearts 358/2 Days. 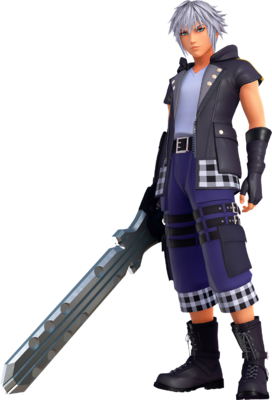 Even in Kingdom Hearts II and when he is playable in Kingdom Hearts 358/2 Days, he holds Way to the Dawn on the opposite side, though the blade faces a bit to the side. ↑ Kingdom Hearts Birth by Sleep Ultimania "To use a Keyblade you must have been chosen to inherit as well as been chosen by the Keyblade itself. In Kingdom Hearts Birth by Sleep you could see that Terra performed the ceremony with Riku, and that is why Riku was able to take the Keyblade that Sora used." ↑ Kingdom Hearts 3D: Dream Drop Distance, Young Xehanort: "Yes. We originally had our sights set on you. But, you developed a certain... resistance to darkness."